A Wrinkle in Time, written by Madelaine L'Engle, is a Newbery Award Book. Written in 1962, the themes of good versus evil, being different, and the difficulties of growing up are still relevant today. Considered one of the first science fiction stories for young readers which also combines elements of fantasy, this novel explores the concept of time and space travel by being able to tesser - a way to travel quickly to other planets. Meg, Meg's little brother Charles Wallace, and Calvin must travel to the planet Camazotz to rescue Meg's father, who is being held by IT. Aided by three unusual characters, they must use their individual abilities and differences to release Mr. Murry and return home. This is an excellent book for teaching higher level vocabulary words and the skills of characterization, compare and contrast, and idioms. This unit divides the book into five sections. Each section has a list of vocabulary words with the definition as used in the book and the page number where the word is found. (2005 edition Random House ISBN #0-440-99805-0) A quiz which tests the students knowledge of the vocabulary words and comprehension questions about the section are included. Section quizzes and the final book test are given in both a regular format and a modified format. 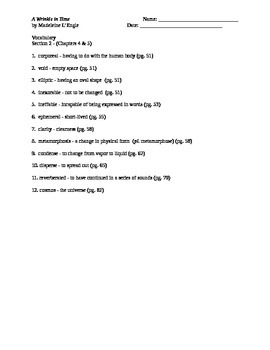 The modified test (Form M) breaks the vocabulary list into smaller units and gives the page number as reference for the comprehension questions. 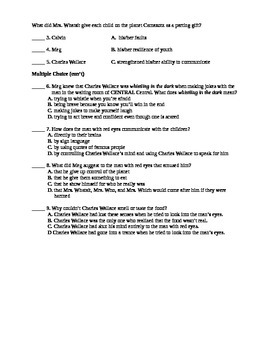 The final test consists of fifteen true- false questions and ten multiple choice questions. A final vocabulary test is separate. It tests twenty of the words from all five sections. 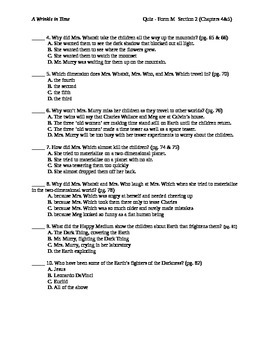 Answer keys are included for all sections quizzes and final tests in the same format to make grading easier. Written by Jane Maitski. A Wrinkle in Time by Jane Maitski is licensed under a Creative Commons Attribution-NonCommercial-NoDerivs 3.0 Unported License.